My oldest daughter trained with her elementary school’s running club for a 5K. She is 11 and she had run two 5Ks before, but this would be the first one she would run by herself. It turns out that the PCRF Reaching for the Cure 5K made an excellent choice for her first solo race! It offered a well-marked course, a medium-sized field of runners, a great cause, and a super-fun finish line expo with lots of activities and free food for both the participants and the spectators. My daughter joined the team for Diann’s Defenders. After Diann’s cancer diagnosis at the age of 5, she underwent two and a half years of treatment and has since remained cancer-free for five and a half years! Some of Diann’s Defenders after the race. On race day our family woke up at 5:30 a.m. to get to the race in time for the 7:15 start for the 5K. I should have printed out the directions to the parking area from the race website instead of following the Google Maps directions to the street address. Of course several roads were blocked off for the 5K, 10K and half marathon courses and there really was only one way to get to the parking. I ended up dropping off my daughter and husband near the starting area and going back to follow the directions from my phone. Once we reached the parking structure there was plenty of parking remaining but I have to say, it was a L-O-O-O-N-G walk from the parking structure and I saw several racers running on their way to the starting line. Tip: Build in an extra 15 minutes for parking and walking. My daughter finished the race in just over 32 minutes. She was happy with her time and super proud of the fact that she ran the whole way without stopping. The school running club had only had two training sessions (a third was canceled due to 100 degree heat) and the rest of the training she did on her own. It made me really happy to see her stick with it and achieve her goal! After the race we made a beeline to the Jamba Juice tent for free smoothies for everyone. Then we visited the petting zoo, the puppies, the train, the inflatable bounce houses and slides, and best of all, the trampolines. Even my 4-year-old got in on the action. She got strapped into the harness and bounced high without fear! 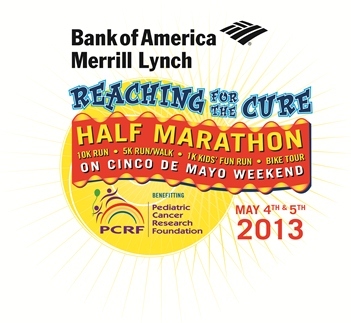 Race pros: First off you cannot beat an event for such a good cause as the Pediatric Cancer Research Foundation. There’s a positive energy at the race and I think it takes a little bit of the competitive, nervous edge off (even though it’s a race for serious runners as well as fun run/walkers). The race is well-organized and family-friendly. Runners are allowed to push their babies and toddlers in strollers on the course. The best part though is the post-race expo with all the free food and family activities. My kids all had a blast. There weren’t long lines for bounce houses or even the trampolines and we spent over two hours going from one activity to another. Tip: bring a change of warm, dry clothes so you can stay and play in comfort! The cool, overcast weather was perfect for running but it felt downright chilly when we were milling around after the race! Race cons: None of the cons would keep me from highly recommending this race for kids and adults. There’s always room for improvement though, so here’s what I would say: (1) The long walk from the parking structure made it hard for racers to get to the start on time and hard for supporters (especially 4-year-olds with short legs!) to get to the start line. That could be overcome with better planning on our part, but I did hear that parking used to be more convenient and perhaps it should be switched back if possible. (2) My daughter’s registration was not processed properly. We were charged the money for the event but I had to follow up with a phone call to actually get her registration processed. I think it was a one-time mistake of lost paperwork though and the PCRF people were very helpful and nice when I called. (3) There were plenty of porta-potties but one long row did not have a hand-washing station within sight. (4) The race took place on Sunday, May 5 (yes, Cinco de Mayo) which happens to be the same day as two other local-ish, popular races: The OC Marathon and the Safari Park Half Marathon. Again, those were minor details that did not overshadow a great race experience at the PCRF Reaching for the Cure 5K! 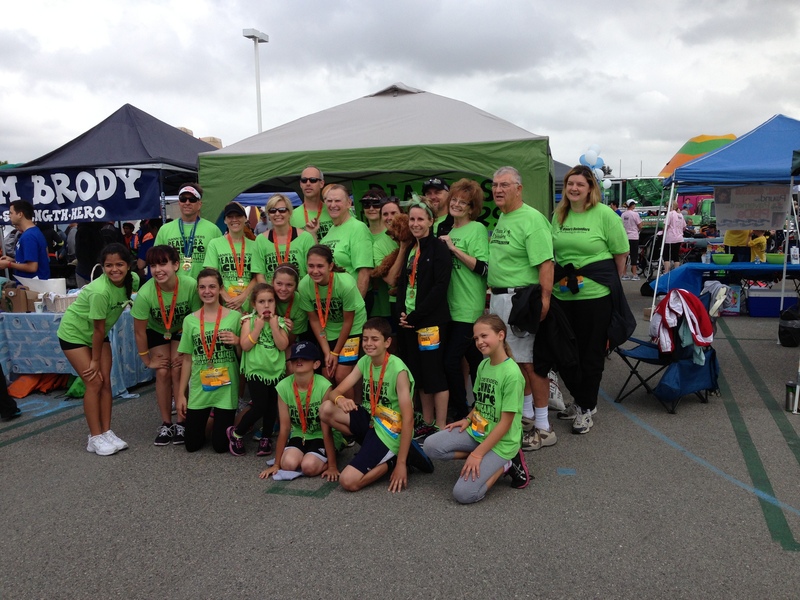 I was bummed it was the same weekend as the OC Marathon as well…that said, this was absolutely THE BEST kids race ever. All 3 of mine did it and I was thrilled. On the parking, I actually talked to the race director, and I guess the Irvine Company or Taco Bell or someone actually tore up the usual parking lot the day before the race – whoops! Well that explains the parking location, and I guess we should be grateful there was a decent alternative with ample parking! I agree it was the best kids race ever — I’ve never seen better activities at the finish line and I really appreciated that it involved the whole family so it was fun for the spectators/support crew too! The Brea 8K has an awesome food court after the finish, but only for the racers (not family, unless they pay) and no activities. Congratulations to her for running the whole distance. That’s awesome!! Sounds like a great event. Thank you so much for joining up with us! You are an inspiring family! It’s a great feeling having your children follow in your footsteps (no pun intended). Thank you, April! We felt honored to be a part of the team and it really was a great race! My daughter has worn her Diann’s Defenders t-shirt to school with pride!